Let me fill you in on my foodie life the last few days. …‘Cause, I mean, you probably don’t want to hear about my NON-foodie life. Like, my actual life. It involves things like dropping vacuums down flights of stairs and spilling dust buckets over freshly-vacuumed stairs. And lots of four letter words. And that’s no fun. Amirite? So let’s stick to food today. 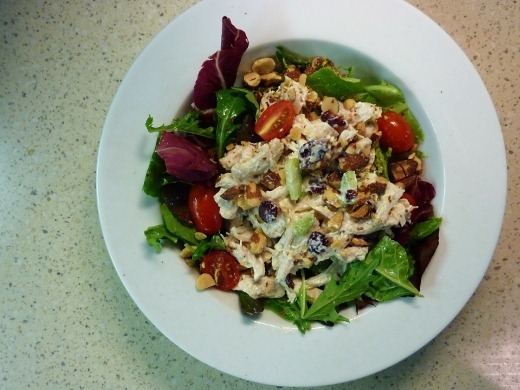 This past week I made this Creamy Chicken Salad for dinner one evening, for which I found the recipe at Cooking Light. A very tasty salad indeed, served atop organic baby greens. 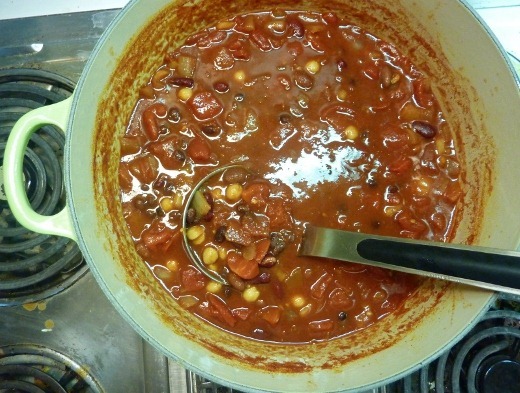 This chili turned out well, being seasoned with primarily chili powder and Worcestershire sauce (which isn’t technically vegetarian, as it contains anchovies). However, I ended up desiring a bolder flavor, which prompted me to add several dashes of smoked paprika, cumin, and cayenne pepper, to add heat and smokiness. 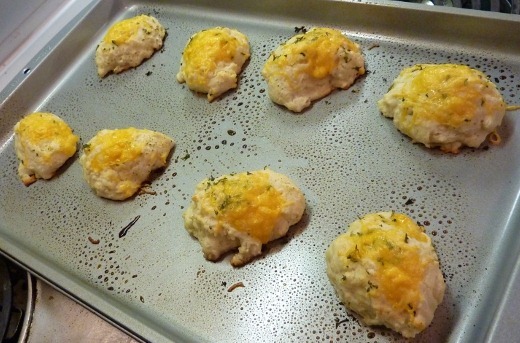 This made a huge batch, which we had for two dinners and one lunch. This past week I also received the results (I passed!) to my work-related certification exam (I passed!). 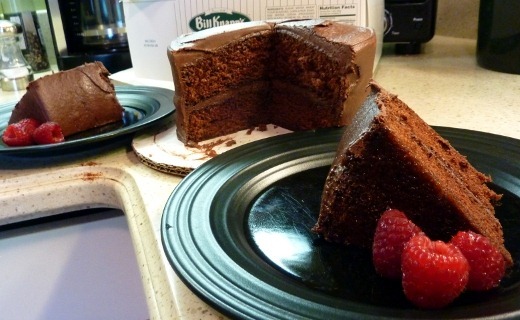 I am now a Certified Clinical Research Professional, to anyone who cares, and so the huz surprised me with a Bill Knapp’s “Celebration Cake.” You remember these cakes!? You can still buy them apparently. This weekend we hosted in-laws and made burgers. 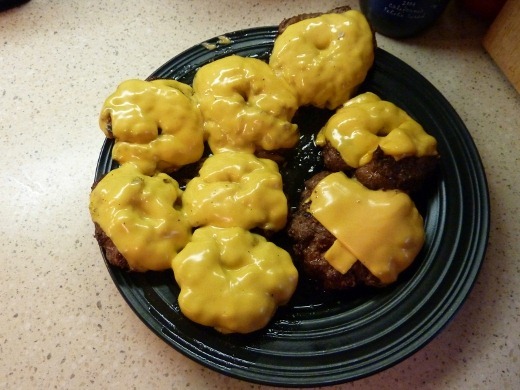 My mother-in-law has been living in Taiwan for much of the past couple of years (but is here in Michigan now), and a big juicy American burger is apparently difficult to come by over there, so the huz grilled a platter-ful of them. Also, every time we grill, I attach the suffix(?) “-fest” to the food that we make. Couldn’t tell you why. To go-with, I also made my favorite potato salad, and chopped up an entire watermelon. This is the first time I’ve had watermelon all summer and I was swooning the whole time I sliced that sucker up. My goodness I love watermelon. This meal was somewhat of an attempt to recreate the burger combo at Max & Erma’s that we’ve ordered before, which consists of soup, burger + fries, and ends with a warm chocolate chip cookie. 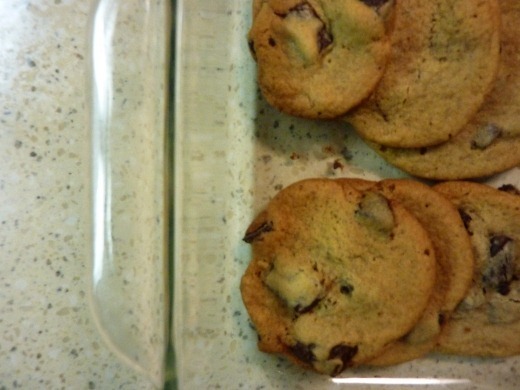 So, for dessert, I made some chocolate chip cookies. With dinner I tried a new wine I picked up at Trader Joes (for only $3.99!!!!!) 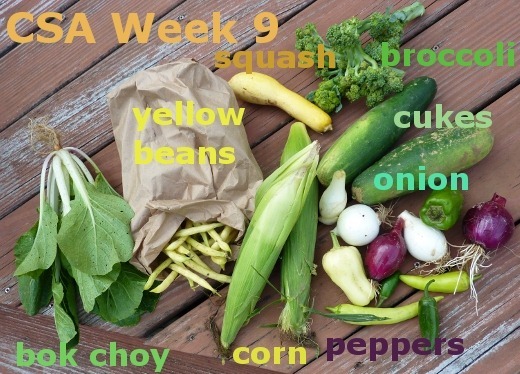 this week, and it was surprisingly not bad at all for the price. Nothing earth-shattering, but just an extremely smooth red wine. No funky alcohol aftertaste that sometimes comes with cheapy wines – just smooth, easy-drinking. I’d definitely get this again for the price. 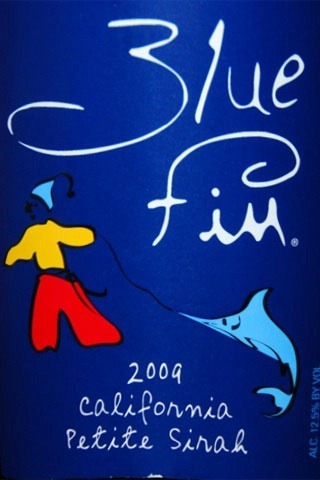 It was a Blue Fin Petite Sirah (2009) from Napa Valley. 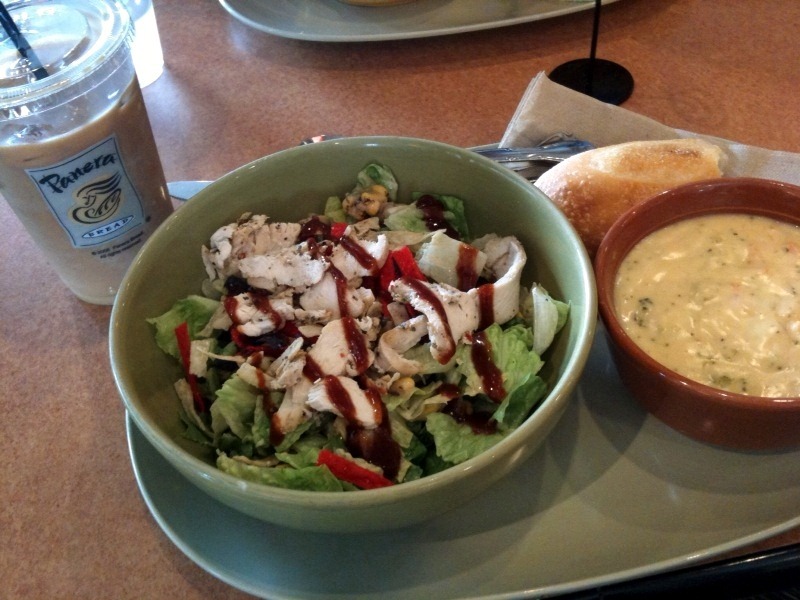 Today for lunch I made a rare trip to Panera and did the Pick-2 combo with a BBQ Chicken Salad + Broccoli Cheddar Soup. And iced coffee!! I LOVED that it was serve-yourself iced coffee! I am extremely particular about my iced coffee, so assembling it myself was fantastic. Last night I saw Crazy Stupid Love at the theater and it was good. The trailer looked pretty enticing, so I was quite excited for this movie. I mean, Ryan Gosling. Steve Carell. Ryan Gosling. Muse music. Oh, and Ryan Gosling. I expected more of a drama, so the movie just didn’t quite live up to my expectations, but I did still like it. I had in mind more of a gritty drama, but it was more of a light-hearted comedy. Currently listening to: Save Me – My Darkest Days. 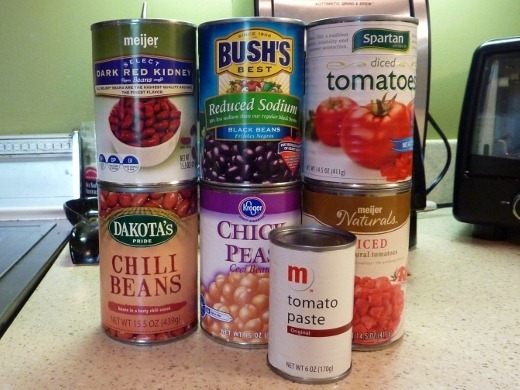 Pingback: Chili Recipe Round-Up | Meg.Goes.Nom.Nom.